From the perspective of delivering successful projects, the value of a skilled project sponsor and project manager outweighs many other factors. Projects need leaders who can give them vision, identity, keep the stakeholders and the project team on board and make the difficult decisions that will enable the project to continue (or, if necessary, be terminated). These are human skills that don't necessarily feature large in the project management bodies of knowledge. 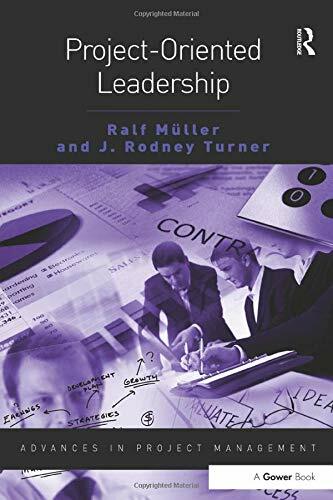 Ralf MÃ¼ller and Rodney Turner's Project-Oriented Leadership explains the key leadership models of managerial, intellectual and emotional leadership and shows how they can be applied within projects to lead processes, functions and people, and ensure an ethical and inclusive approach within projects and programs. Ralf MÃ¼ller is Professor of Project Management at BI Norwegian Business School. In parallel he is the managing director of PM Concepts, a Sweden based Management Consultancy, which advises larger enterprises in project, program and portfolio management. He lectures project management, project leadership, project governance and research methodology. His research focuses on project, program and portfolio management improvement from an organization-wide and leadership perspective. His research studies have appeared in more than 120 publications and he is frequent speaker at global researcher and practitioner conferences. As a consultant he worked in 47 different countries, for the improvement of project related practices in large organizations. He also managed national, international and global IT projects and consulting organizations. Dr MÃ¼ller is a member of the Editorial Review Board of several international academic journals. He is a member of the Consortium for Research in Emotional Intelligence in Organizations, and a co-founder of PMI's Frankfurt and Munich Chapters, as well as contributor to the PMI Standards for Organizational Project Management Maturity (OPM3), Program Management, and Portfolio Management.